Creating an oxygen free environment within a barrier bag made with Marvelseal, Aclar and Ageless can be a costly investment of time and money. More often than not, when this system fails, it's the fault of a bag seam that was not properly sealed. To reduce the risk of improperly sealed seams, seal your bags with a heat sealer made specifically for that purpose. 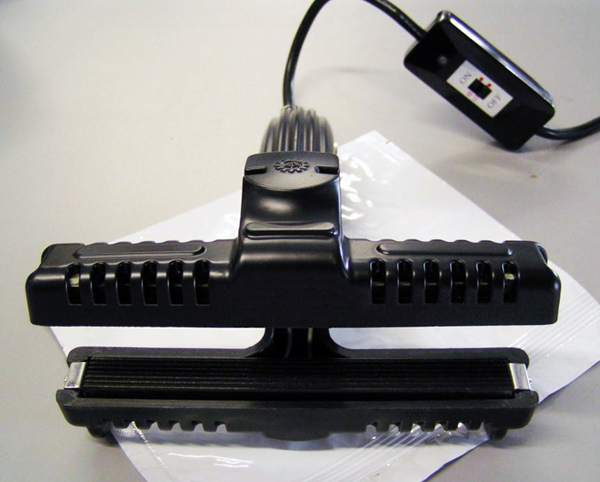 Our portable heat sealer forms strong, and clean seals. The sealer is equipped with 2 heated 1/2" wide and 6" long Teflon coated serrated jaws. The adjustable temperature switch has 2 temperature settings, 350 and 450°F. The jaws are sufficient to seal any type of heat sealable multi-layer structure. Any size of bag can be sealed using this heat sealer.